One of the people on my chassis list is trying to find more information on this Ducati (851-916 he thinks) which has an FFE that appears similar to the ones Tony Foale used on his "Q" bikes. With the German caption and Metzler sticker it seems possible it was built in Germany. Is the large luggage container above the rear wheel the fuel tank ? 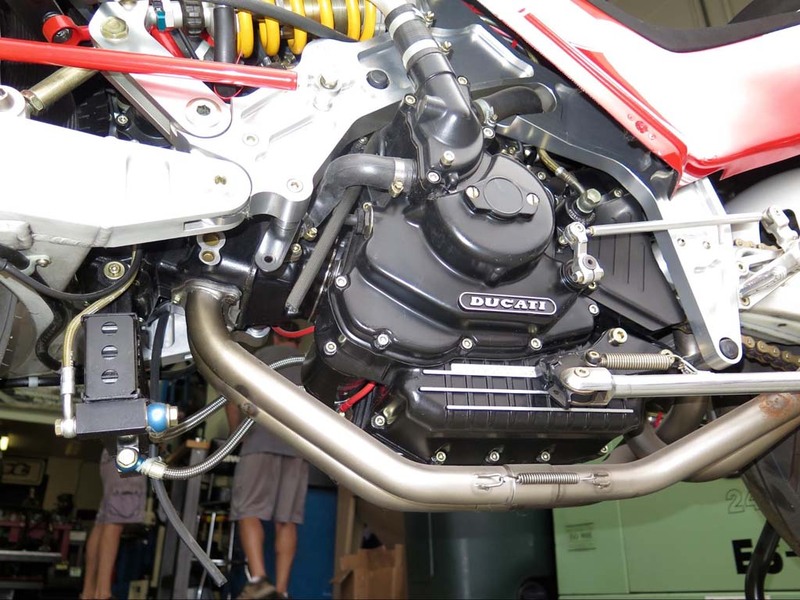 From memory it wasn't till the second gen of the 888 engines that Ducati got stronger cases homologated. Up till then you needed deep pockets to race one. Actually, that didn't change, lol, but at least the cases lasted longer. I will fix my typing later, i think pretty much every model got stroger cases 851 twice 916 twice and 996 at least once the cases and cylinders got so much heavier that by about 97 even with the same weight as the fours the Ducati stopped carryinng lead ballast. which buggered up the weight distribution, but much less oil wss spilled. Pretty sure one of the Tesi was a Ducati. TRhe 916's frame also went around the swngarm pivot to lessen the stress a little. From what i understand the major weakness was that the cases had to carry the preloaded bearings as well as the lack of metal as each engine grew. The supermono with smaller lighter cases and bigger bores but plain main beearings gave no issues, The 916 was meant to have plain mains, but there were no lira for retooling. Does this look like the same front end? It's a VV BMW raced in european Battle of the Twins series. Ulrich Volkel (or Voelkel). Did a quick Google but only found that he now runs an engineering company in Shanghai and 2-ventiler.de is a forum for BMW airheads (no comment!). Just noticed: Metzeler logo on the BMW tank, too? Guy, that does look the same. I only had photos of the VH (not VV) FFE and it has the lower arm attaching above the axle (I think like Parker/GTS). Michael, here are some Parker pics, with two versions of front suspension. I see hes used tonys software. That last pic, They have welded up around the Piston on the caliper? In the 1985, driven by market demand, Magni bikes became completely Italian with a long-lasting relationship with Moto Guzzi for engines. The first Magni model with the new engine was the "LeMans" incorporated a full fairing, contemporary lines and a innovative rear suspension system designed by Magni called the "parallelogrammo". This new suspension system eliminates the reactions normally induced with shaft drive motorcycles. The "parallelogrammo" suspension enables the bike to perform much like a chain-drive unit. From then on, other similar systems have been developed by other manufacturers.